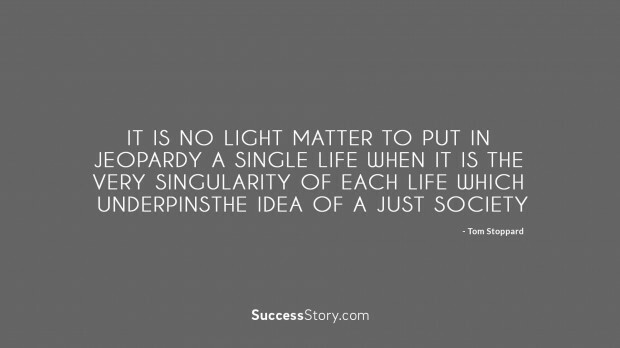 Tom Stoppard’s quotes on the importance of single life in society show his sensitivity and concern towards human. Being a notable playwright and screenwriter along with linguistics and philosophy theme he majorly worked on human rights, political freedom and censorship. His contribution to the TV, radio, stage and film is exceptional. Along with his intellectual reforms he displayed his human side at many places of his work. His quotes also convey very touching message that as the society builds up with people, every single life is important. He worked as a playwright for National Theater and it gave him a status of international level. "It is no light matter to put in jeopardy a single life when it is the very singularity of each life which underpins the idea of a just society "
He had an honor of co-writing screenplay for Academy Award winning film Shakespeare in love in the year 1998. He was a considerate artist who had produced many socially engaged contents. From the year 1977, he took active participation and involved himself in human rights issue. His quotes on society also talk about basic human right of every person. He was involved with various associations and wrote in various newsletters about human rights. He was socially conscious along with his intellectual talents. He also shifted his focus from argumentative work to emotional openness. His work also shows integration of heart and mind. His work talks about human being not merely a language. He loved the theater as a medium of creative expression. He was been awarded many prizes for his work and he was also honored with many prestigious titles and positions.